DEAR FRIENDS AND NEIGHBORS: WE ARE MOVING FORWARD AND OUR PROJECT IS MAKING GREAT STRIDES TO A CERTIFICATE OF OCCUPANCY THAT WILL ALLOW US TO OPEN OUR DOORS IN DUE TIME! IT IS THROUGH OUR COMMUNITY EFFORTS THAT WELLFLEET WILL CONTINUE WITH A LANDMARK RESTORATION - OUR HOME FOR A CONTINUITY OF ASSOCIATION THAT IS RICH AND STORIED - WELL INTO OUR FUTURES ! We are moving ahead with hopes for our doors re-opening at our Hall in Summer 2019. The new septic system - Handicap Entrance ramp- front and side entrances - safety Lighting - handicap bathrooms - all are near completion. We would like to thank all of our members and the Annual Town Meeting of Wellfleet, and all of you who have made contributions to our efforts to restore our Pond Hill School Community Hall. If you have an interest in joining our Association….or an interest in Volunteering for the Board of Directors for 2 years…please indicate interest : info@swnasu.org . This letter also serves as an invitation to you to Renew your SWNASU Membership for 2019. Our membership rates have not increased greatly over the year, and we are looking forward to opening our doors and welcoming the membership and community to reinvigorate the building with your prescence! Our volunteer board and members have made much progress in our efforts, and your help in this initiative is instrumental and appreciated. We have worked so hard - and have come a long way!. Thank you for supporting a long and vital Future for our Neighborhood Association and Historic Pond Hill School Community Hall ! We welcome our new volunteer members to the b.o.d. : Cody Olson, Paul Davies, Brett Fortin, and Steve Verney ! In 1937, a group of individuals in Wellfleet realized the need to become stewards of what would become the last standing original schoolhouse of their fishing community, known as the Fisherman's School. The South Wellfleet Neighborhood Association and Social Union, established in 1937, promotes and fosters the spirit of friendly cooperation that enhances the social, economic and historic fabric of our community of residents and visitors. This social union is dedicated to preserving the Pond Hill School Community Hall as an historic landmark, library and meeting facility. Pond Hill Community Hall is stewarded and owned by the members of the South Wellfleet Neighborhood Association and Social Union. We are currently restoring and preserving our fishing school and history. It is at this time that we especially ask for members and supporters in our local community - and all those interested in Cape Cod's heritage - for your contributions to bring the building to occupancy. The considerable efforts, time, and energies given by our volunteer board and members have brought an historic preservation project far forward- and the Pond Hill School will continue to serve our community into further generations. We hope at this time, that you will join us in supporting the completion of the project. Your support in this town meeting effort in achieving our restoration of the building - the home of our open-membership organization will continue to bring opportunities to our community on so many fronts - and well into the future: employment for local tradesmen and women, a resource for small year-round businesses, a community kitchen, and cutural programming that reflects and educates the community and guests from within our membership's considerable talents and experiences. We have much to be thankful for. Our Restoration Project at our Pond Hill School has been moving forward on many fronts. We owe a huge debt of thanks to the Wellfleet Community Preservation Act and two votes of Wellfleet Town Meeting, along with a very generous $50,000 Historical Restoration Grant from The Massachusetts Historical Commission, and to the Cynthia Woods Mitchell Fund for Historic Interiors through the National Trust for Historic Preservation, and private contributions to this Outer Cape Historic Restoration Project. We have also received numerous Private donations that have been vital to the ongoing Project. Thanks also go to local donors and the Tern Solar Foundation for 3.6kw Solar PV’s on our new Solarized Community Access Kitchen Roof. We have installed 11 high power/High efficiency panels and a series of Micro-inverters to generate the electricity we will need for lighting, heating and cooling in our new Kitchen. •	Massachusetts Historical Commission Historic Building Preservation/Restoration Standards have been observed and adhered to. We are almost there ! Along the way we encountered some unexpected hurdles and time delays that drew down our funds. We are so very close to completion, yet we need to close a $100,000 gap in order to meet our goals and finish the project. 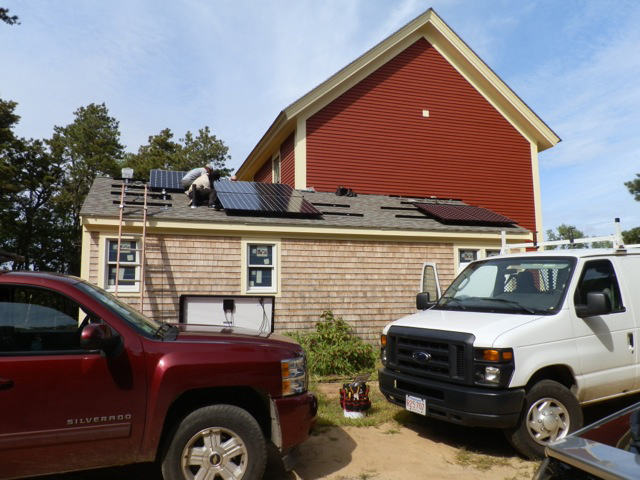 Congratulations to the Greater Wellfleet Community and SOLARIZE WELLFLEET for these steps in our South Wellfleet Future! Please let us continue with these efforts by joining us to fund the project. You can become a member, or renew your membership. If you are already a member, please donate again to help us finish this historic renovation which will allow us to open the doors to the South Wellfleet Hall and our new Solarized Community Access Commercial Kitchen facilities. Thank you, in anticipation of your contribution. Sincerely, Your neighbors, Charles P. Cole, Project Coordinator Pond Hill School Community Hall Restoration project & the South Wellfleet Neighborhood Association and Social Union Board of Directors ! It's easy to renew your membership online. It is also possible to make an online donation. Thanks to the Wellfleet Community Preservation Act and two votes of Wellfleet Town Meeting….Along with a very Generous $50,000 Historical Restoration Grant from The Massachusetts Historical Commission —and many of your own contributions to this Worthy Outer Cape Historic Restoration Project— Almost ALL of the Historic Restoration Work has been completed….to a very high and impressive standard. What stands in our way…..at the moment….is funding the SYSTEMS that will allow us to use the building as a contemporary Meeting space and Community Center. We DO need a rebuilt Front Step. 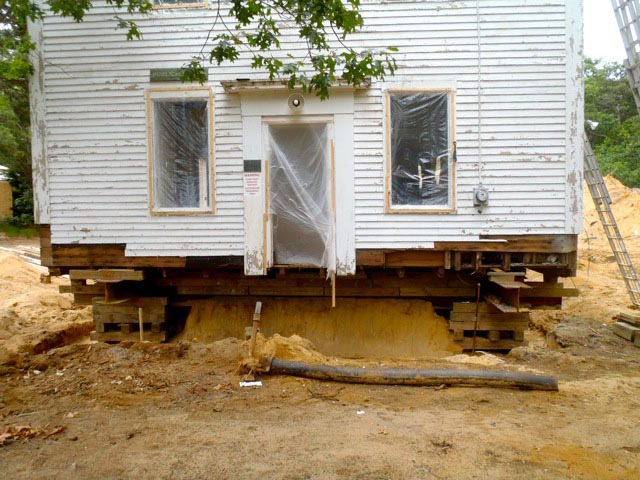 This step was removed to Facilitate the building of a new foundation and replacement of all historic Sills….in 2012. We plan to rebuild the Concrete Steps that were first constructed halfway through the LAST century. If anyone has photos of an earlier STEP-Incarnation….please send them along!!! 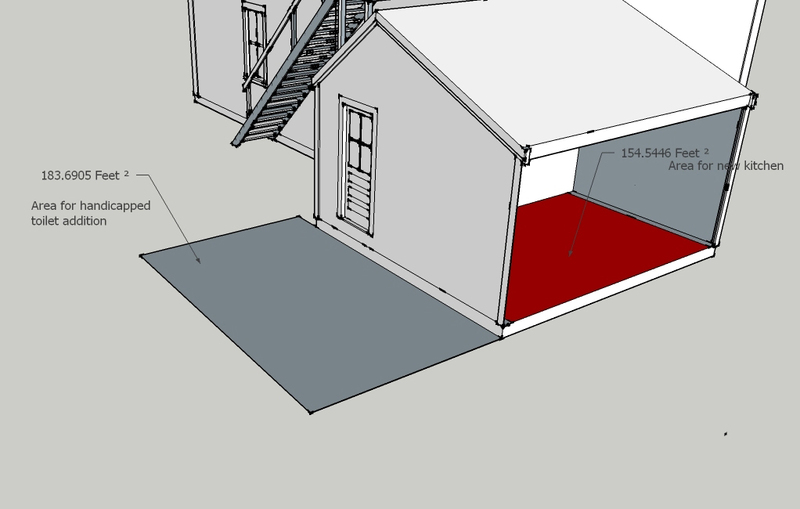 We could still re-adjust our planning for the front step if we can find Historic Documentation of an earlier configuration. 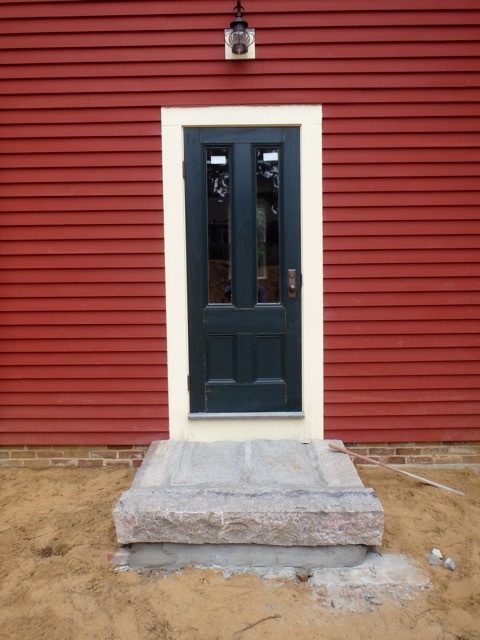 — We have extracted two great pieces of Granite from that 20th century front step….and were given another Lighthouse slab by Buddy Paine that will become the side entrance/Exit where we have constructed a new door. Most of our needed Commercial Kitchen Equipment was acquired from Adrian’s Restaurant when they closed for business - two years ago. We will need Plumbing "funding" to install that equipment. 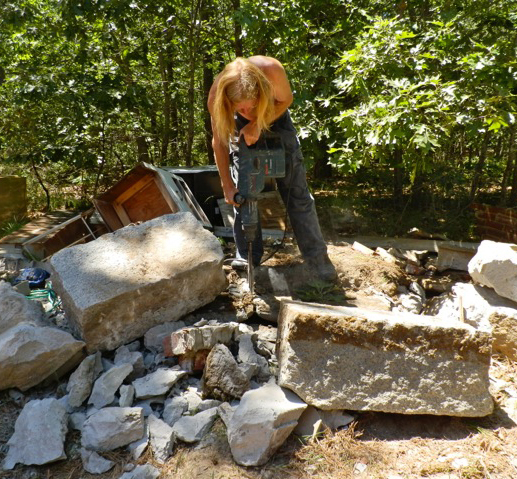 — The Installation of a Septic System that will accommodate those bathrooms ….and the grease traps…. and handle the capacity of a Community Access Commercial Kitchen is of PRIME CONCERN. Those funds are NOT currently available. — Finishing our NEW electric service…..and Plumbing work….will all require additional funds. — Eventually the Library upstairs….and the Historic Display room downstairs will need resources — We Could use an historic Schoolhouse Wood stove for those chilly New England Winters. The chimney has been relined and rebuilt for JUST that Purpose !! 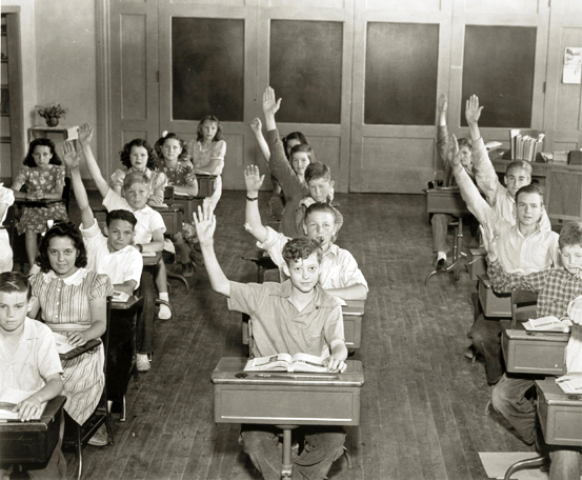 We are requesting ….that all Community Members that might have waited until we at SWNASU could show GOOD FAITH progress in Saving our Pond Hill School…..and NOW - in the Spring of 2015 - would like to make their Financial Contributions to the Hooking up and Installation of our Kitchen gear and funding our 2015 required Septic System….Please….. Let us know how you can facilitate our PROJECT….and Help us OPEN the DOORS to our Restored Pond Hill School Community Hall . We intend to hold our Annual Meeting of members and friends…on the Traditional Date of the third Saturday in August - August 15th, 2015. We may have to try it outdoors until we have secured our C. of O……but you WILL have a chance to check on our progress….and take a tour of our newly restored Schoolhouse….originally constructed in 1857. Please let us CONTINUE with these efforts….by Joining in to fund YOUR Hall. Become a member….Renew your membership……and help us to OPEN the doors to the South Wellfleet Hall and our new Solarized Community Access Commercial Kitchen facilities. Thanks…..in anticipation of YOUR involvement….and contributions. Sincerely and with Pride in our efforts so far…..
your neighbors…… Charles P. Cole— Local Project Coordinator of the Pond Hill School Community Hall Restoration project …. Historic Pond Hill School is located near Drummer Pond, near Paine Hollow Road in the South Historic District of Wellfleet. Operating as the “Fisherman’s School” for South Wellfleet schoolchildren from 1857 until it’s closing in 1880, due to regionalization. 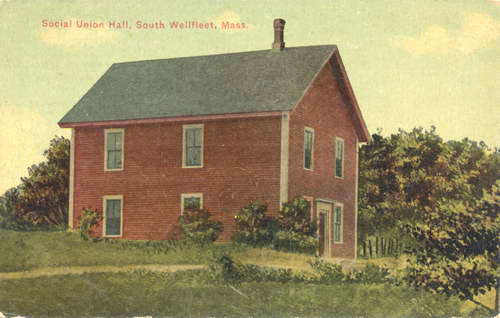 In 1888, a small group of Wellfleet women suffragists-The Ladies’ Social Union- bought the vacant district schoolhouse from the town, reopening it as a community hall for social gatherings. In 1912, a reading library was established on the second floor. As these Ladies of the Social Union fell into their twilight, they transferred stewardship to the members of the South Wellfleet Neighborhood Association and Social Union. By 1937, SWNA(SU) was formally founded. 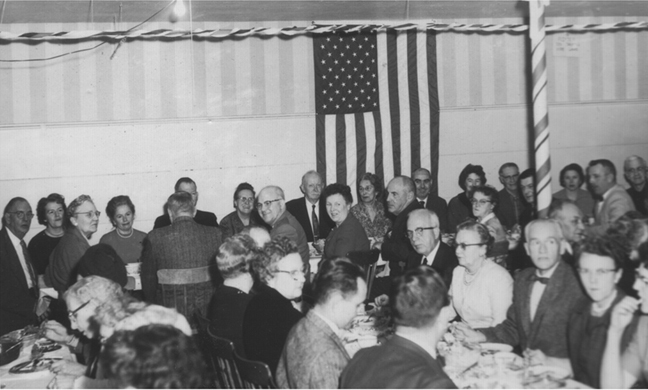 By the 1950’s, members built a small extension to the building, providing interior bathrooms along with a small kitchen inside the historic building, due to popularity of their potluck suppers. As Wellfleet and the outer cape’s demographic trends and socioeconomic status changed, SWNASU’s membership dwindled. In 1998, the kitchen was closed for formal use, due to noncompliance with updated public health standards, although SWNASU was able to continue the tradition of monthly potluck suppers followed by a program. Programs and classes that were not kitchen-dependent were offered to the public for a small fee. In the year 2000, Pond Hill School Community Hall officially became a "not-for-profit entity", changing the mission statement and purpose toward preservation and restoration of this historic building. By 2008, this two story schoolhouse was showing deep need of extensive repair and preservation. 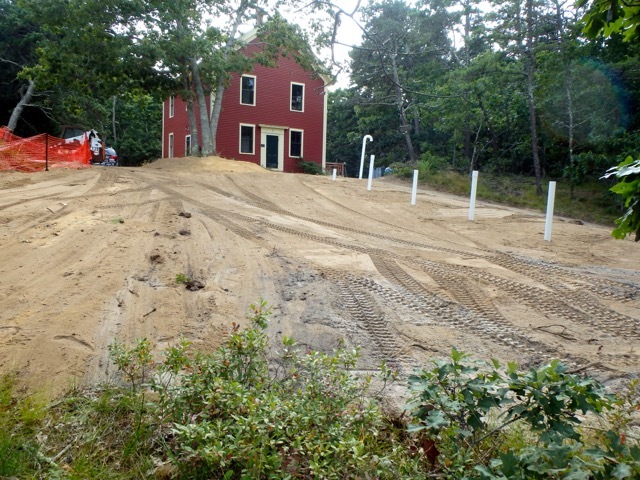 In 2010, Wellfleet voter’s approved granting SWNASU- the funds for restoration through the Massachusetts Community Preservation Act (MCPA). Today, our restoration project includes monies from our fundraising efforts along with funding support from MCPA for the extensive exterior work; National Trust for Historic Interiors, Cynthia Woods Mitchell for Historic Interiors grant (with matching funds, fund raised, by SWNASU). 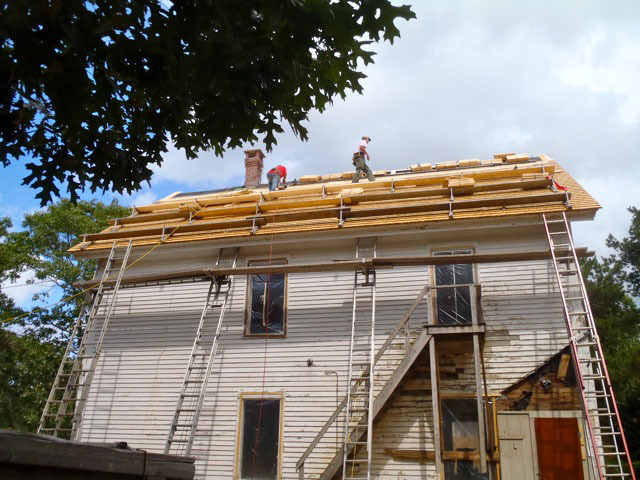 Massachusetts Historic Commission (MHC) MPPF Round 17 grant-funding provides funds for our historic chimney, original window and door repair, a new Cedar roof, and interior paint and plaster. Dedicated members, who love the building and its history, are donating their time, skills and money to help reduce the cost of this extensive and historic project. 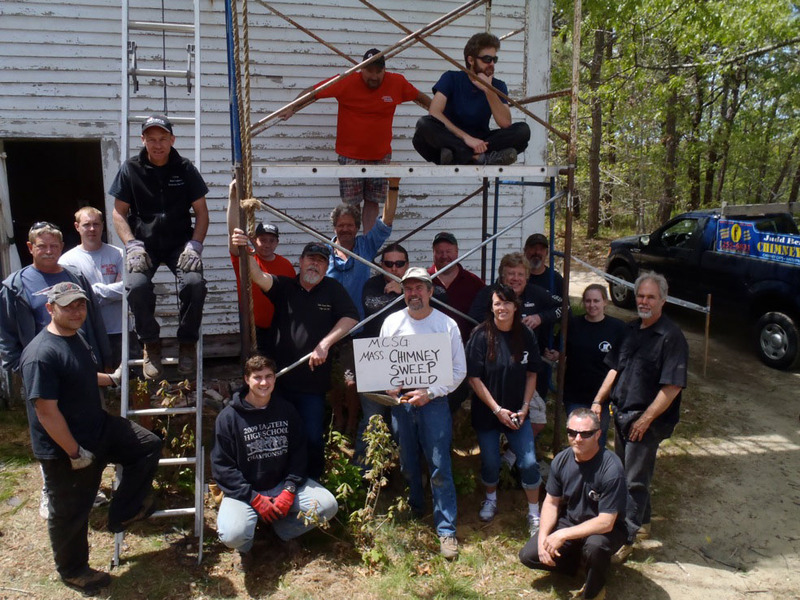 This small grassroots organization is preserving an important piece of architectural, educational and social History of Wellfleet. Our goal in restoring this historic fisherman's’ schoolhouse is near completion….and to re-build a small commercial kitchen for the local community to rent at a fair and reasonable rate. We are almost there! We have “reduced, reused, and recycled” by replacing the original bricks by cleaning them instead of disposing them…rebuilding…re-lining/Insulating and using our original chimney and are building our commercial kitchen with commercial kitchen equipment from a North Truro restaurant that has closed its doors (Thanks to Adrian Cyr and family!). P.S. - We are looking for a Local Carpenter who would like to help restore our Historic Outhouse…....we will supply Materials. This crafts-person would get the recognition…down… thru the ages!!! In addition to joining or renewing your membership, we ask you to consider a gift to our Building Fund so that we may finish the project as it was originally conceived, with a fully-functioning community kitchen capable of supporting not only our monthly suppers but also rental activities and fund-raisers, including rental use for local producers whose products require a Wellfleet Board of Health-approved commercial kitchen. This portion of the project represents a naming opportunity for businesses or individuals to know that their funding of this community resource wil become a lasting part of Wellfleet's legacy. The building made from materials that sailed to Wellfleet in the late 1850's from Maine on a schooner floats again above the restoration of the foundation. Steve Pombo and his crew are on top of it! Our windows are out for restoration. 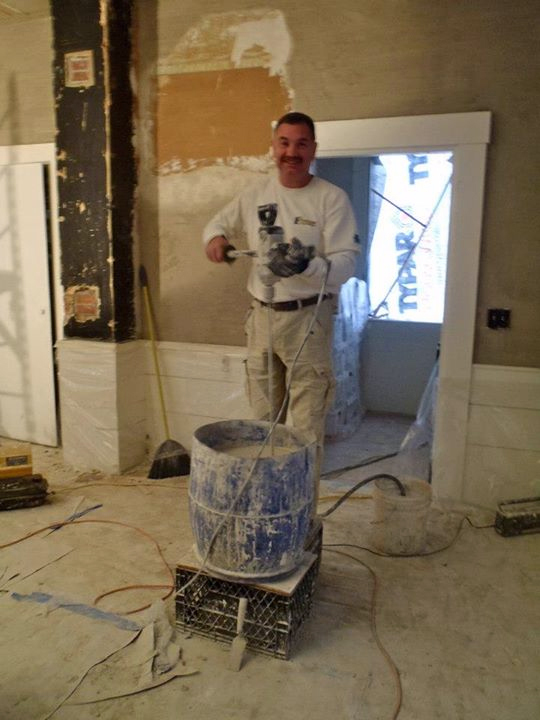 A local contractor, Steve Rose, has been hired to oversee the project, and the restoration is near completion. 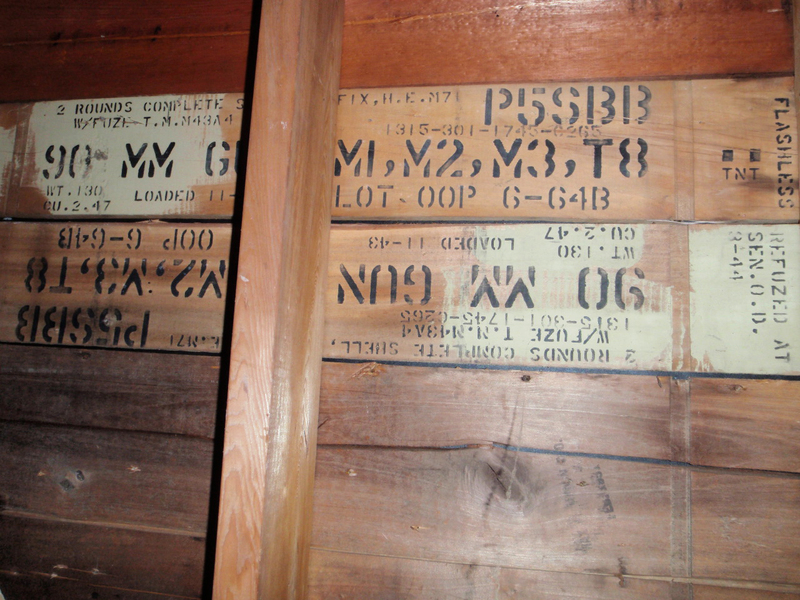 Ammo cases from the Marconi military base were re-purposed in the past for construction of a washroom/kitchen el. They have returned in our new construction. The Cynthia Woods Mitchel Fund supports in part the interior restoration now near completion. Thank you..... to Stephen Bushway of Deer Hill Masonry, his son Mason (mason)! 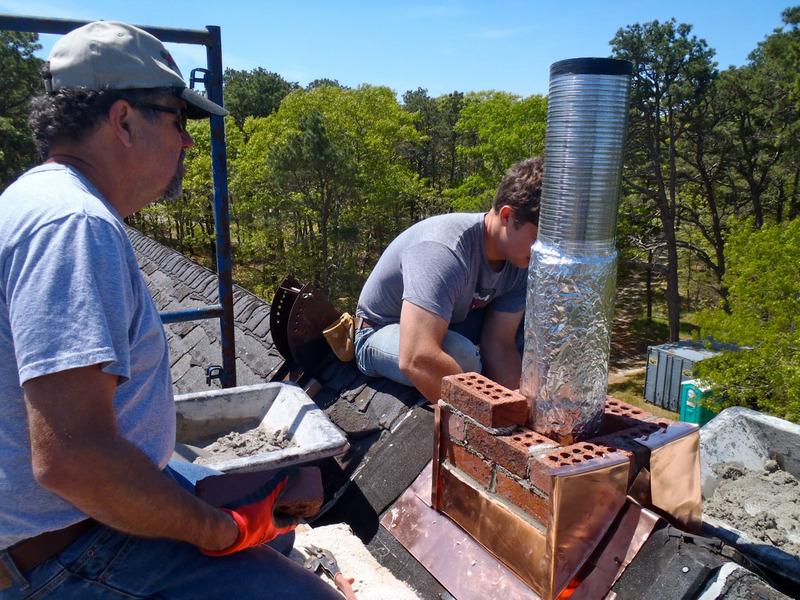 , and to the Massachusetts Chimney Sweep Guild and their help on our Chimney Project, who provided far beyond a day at work with a wonderful seminar for guild members. Thanks for the fine work, fellowship, good music, and a very positive contribution all around! We have so many folks to thank for getting us THIS FAR in our work to Restore the Pond Hill Fishermen's school and Community Hall. We hope that you will stay tuned to our website and Press releases as we go along…..come by for a look see when you are in the neighborhood. This Hall is our legacy from the Past ….and we hope to leave it in good shape for a future that will be just as fruitful as the past for our Outer Cape Community. Thanks in advance for all of your Help to GET THIS DONE!! THE MASSACHUSETTS HISTORICAL COMMISSION AWARDED THE POND HILL SCHOOL RESTORATION PROJECT $50,000. WHILE WE STILL HAVE A LONG WAY TO GO AS WE CONTINUE OUR BUILDING PHASE, THESE FUNDS WILL HELP CONSIDERABLY- TO ALL THE CITIZENS OF MASSACHUSETTS- FRIENDS, NEIGHBORS, ONE AND ALL- THANK YOU! The Cynthia Woods Mitchell Fund for Historic Interiors provides nonprofit organizations and public agencies grants ranging from $2,500 to $10,000 to assist in the preservation, restoration, and interpretation of historic interiors. 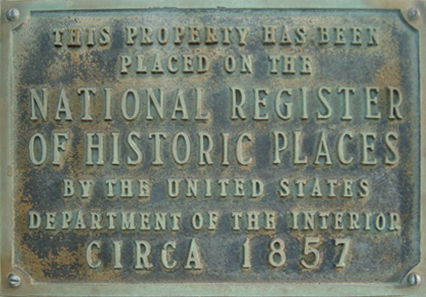 Individuals and for-profit businesses may apply only if the project for which funding is requested involves a National Historic Landmark. Funds may be used for professional expertise, print and video communications materials, and education programs. Our restoration Project was awarded a $7,000 grant by the National Trust for Historic Preservation from its Cynthia Woods Mitchell Fund for Historic Interiors. The seed grant funds will be used for the restoration of the interior of the schoolhouse. "Without organizations like The South Wellfleet Neighborhood Association and Social Union, communities and towns all across America would have a diminished sense of place," said Stephanie Meeks, president of the National Trust for Historic Preservation. "The National Trust for Historic Preservation is honored to provide a grant to The South Wellfleet Neighborhood Association, which will use the funds to help preserve an important piece of our shared heritage." In 1997, a generous gift from George P. Mitchell established the Cynthia Woods Mitchell Fund for Historic Interiors in honor of his wife. 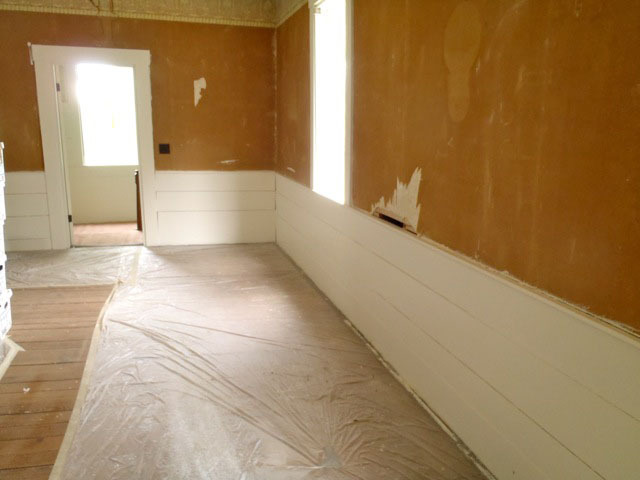 The fund provides assistance in the preservation, restoration, and interpretation of historic interiors. Once a year, Mitchell Fund grants ranging from $2,500 to $10,000 are awarded to non-profit groups and public agencies. Over $135,000 were awarded in 2010. Grants must be matched at least dollar for dollar with public or private funds. The National Trust for Historic Preservation is a non-profit membership organization bringing people together to protect, enhance and enjoy the places that matter to them. By saving the places where great moments from history  and the important moments of everyday life  took place, the National Trust for Historic Preservation helps revitalize neighborhoods and communities, spark economic development and promote environmental sustainability. With headquarters in Washington, DC, eight regional and field offices, 29 historic sites, and partner organizations in 50 states, territories, and the District of Columbia, the National Trust for Historic Preservation provides leadership, education, advocacy and resources to a national network of people, organizations and local communities committed to saving places, connecting us to our history and collectively shaping the future of America’s stories. Visit PAAM Tice's blog about South Wellfleet, as well as David Kew's Wellfleet Page of Cape Cod History. Irene's historic novel “Eva and Henry, A Cape Cod Marriage,”is Paine's debut novel about the life of her own great-grandaunt Eva Paine Smith, a sea captain’s bride, and was awarded a Silver IPPY (Independent Publisher’s) Award for North-East Regional Fiction. This self-published novel was one of many considered from all types of independent presses, including university presses. Irene was brought up hearing stories about her hardy ancestorsintrepid sea captains from Paine Hollow, South Wellfleet- and the self-reliant women married to such men. Curious about the faces peering from old photographs in the family attic, Paine conducted research which led her from the South Wellfleet Cemetery to the Wellfleet Historical Society to the newspapers of the late 1800's. Here in her first novel, Paine illuminates the joys and trials of her own great grandaunt, Eva Paine Smith, a sea captain's bride. Irene Paine holds a B.A. from Rivier College and an M.S. from American University. She is married to storyteller Jim Wolf and has often told stories side-by-side with her husband. She lives on Cape Cod and in Bigfork, Montana. Part of the story of our historic Pond Hill School House and the Ladies of the Social Union are featured in Irene Paine's newly published novel Eva and Henry - a Cape Cod Marriage. Based on the lives of real people who lived in South Wellfleet in the late 19th century, Irene highlights the courageous and intimate lives of men and women of the Outer Cape. “There were many questions about the catastrophic events she had endured that my father's generation was unable to answer, and I found myself being drawn deeper and deeper into the life and times of my great grandaunt, Eva Paine Smith. I discovered that Eva and her husband Henry Smith had indeed lived lives worth writing about". The South Wellfleet setting is as essential to the novel as the characters are, and a central meeting place for much of the village life was the now historic Pond Hill School (circa 1857), first as a school house, and then as a meeting hall, which it continues to be today. 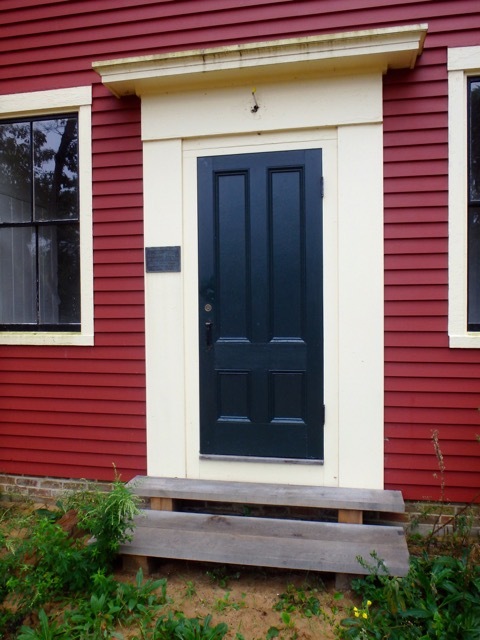 This last remaining school house of the original dozen that were once in use in the town of Wellfleet is still in in need of contributions and sponsors for it's preservation. More about the novel at evaandhenry.com. Become a member ! Build Community ! We wish to remind you that the SWNASU is a 501.C3 non-profit all volunteer organization....and our Pond Hill Schoolhouse is on the National Register of Historic Places. We, the SWNASU Board of Directors, hope that you might consider a donation specifically directed to our restoration project, knowing that your donation is tax deductible. -or through secure payment to Paypal above on this page. Thank you, in advance, for your generosity to this worthy historical restoration project. We will be doubling and re-doubling our efforts to raise the necessary funds. Your Participation is key to our success. Join the Association. Help us Save the Pond Hill Schoolhouse Community Hall...built 1857. James Hadley and Patty Crow of Hadley-Crow Studio designed and guided a Restored Pond Hill School. 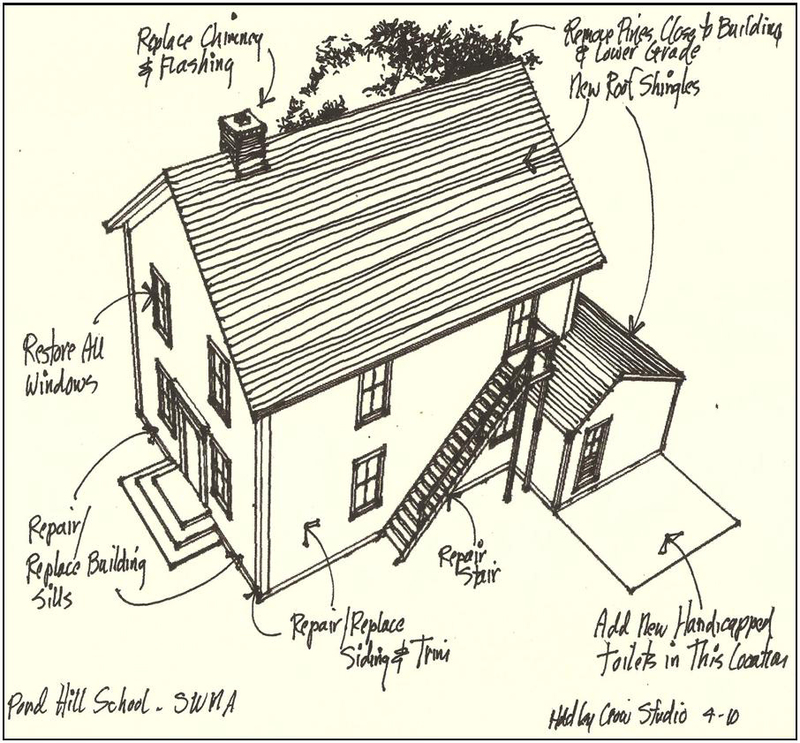 Jim is an Architect with extensive experience with Historic New England Structures. As our historical Consultant....he and his team are "holding our hands" as we execute our CPA funded Pond Hill School Restoration Project. Join us with your questions and Hopes. Jim has worked in the field since the late 1960s, primarily in New York. His firm won the New York State Preservation Award for his work on the reconstruction of a McKim, Mead and White house on Montauk in 2001. He is a former member of the AIA Committee on the Environment, New York Chapter., and has taught design as an adjunct professor at the architectural school of the City College of New York and Environmental Design at New York University. 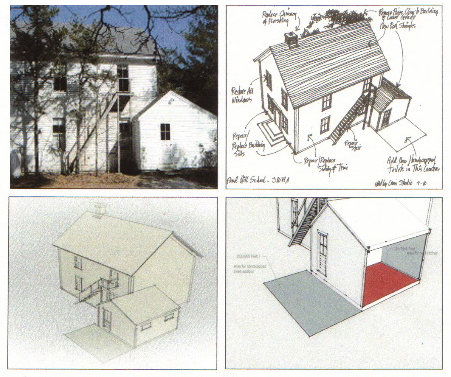 Hadley holds a Masters degree in Architecture from Columbia University, and has received recognition including the New York State Historic Preservation Award- awarded for the reconstruction of the Cavett House, Montauk, NY, and was also awarded by the American Society of Consulting Planners Sustainable Planning Award in 1998, among other recognitions. In 1945, a group of individuals in Wellfleet realized the need to become stewards of what would become the last standing original schoolhouse of their fishing community, known as the Fisherman's School. The South Wellfleet Neighborhood Association and Social Union, established in 1937, promotes and fosters the spirit of friendly cooperation that enhances the social, economic and historic fabric of our community of residents and visitors. This social union is dedicated to preserving the Pond Hill School Community Hall as an historic landmark, library and meeting facility. The activities of this organization have been continuous since that time, and the Association has a newly constituted board of directors that are initiating an effort to bring needed restoration to the building. SWNA continues to serve the public through a program of lectures from within the local community, and our cultural resources run deep. SWNA has provided lectures from local artists, scientists, tradesmen, shell fisherman, and musicians; theatrical presentations, historical re-enactments, health and domestic education seminars, literary readings, films, and brings the membership and larger public together for monthly open pot-luck dinners. 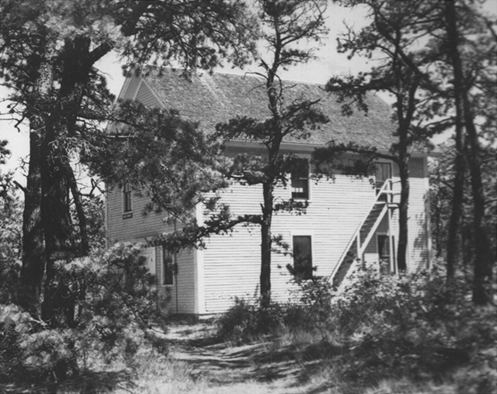 SWNA is housed at the Pond Hill School in South Wellfleet, which was accepted into the National Record of Historic Places in 1989. The school first operated as a public fisherman’s school from 1857-1880. The mission and activities of the association are integrated within our community, and have continued to provide a public forum for the talents and concerns of our local citizens and the larger world for over 72 years.